This banyan tree in Dhangethi Ari Atoll is considered to be one of the oldest prehistoric landmarks in the island. It is estimated that this tree is more 400 years old. 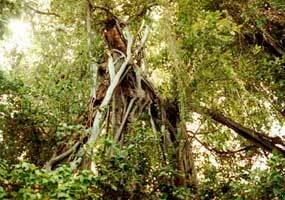 Banyan trees play a vital role in our ecosystem. It gives shade and helps navigate sailors who often look landscape to find their way around when approaching inner atoll ring. Banyan trees also bear a fruit (locally called ‘nika’) when ripen becomes dark reddish. It is sweet and sometimes islanders mix the fruit with sugar and eat it in groups in their leisure time. Some of the roots of the tree hang vertically from branches and were used as part of sails. This wooden pole is locally known as ‘farumaanu’. Maldives need to protect huge trees like this banyan tree as it give immense benefit to the community. 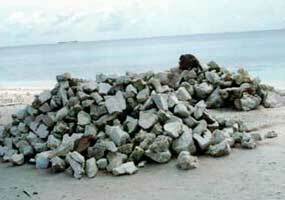 Coral stones have played a vital role in the Maldives as it is used as the main ingredient of house building. This perhaps may be due to that fact that it can be easily mined from the island house reef and is strong enough to last long. It is also cheaper than other alternatives. When it is raw it is easy to break into peaces this gives the builders the opportunity to break huge stones into small pieces. Small pieces can be easily handled in building process and can be easily lifted to heights. Mining stones from house reef has immense negative effects to our island environment. Mining stones contribute erosion of the islands. 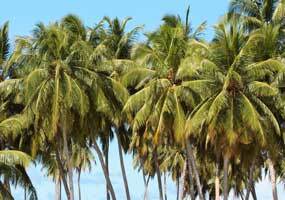 Coconut palm is the national tree of the Maldives. There is no tree in the Maldives who deserves this status more than the palm tree. 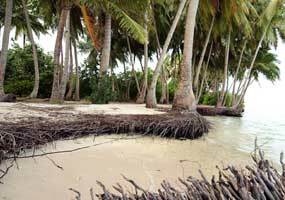 Produce of palm tree is used not only for consumption but also to build houses, furniture, boats and other tools and utensils etc… Palm tree on a beach of an island holds the sand together against waves that constantly bombard the shore. It protects our shores. We need to plant more tree as our ancestors did.